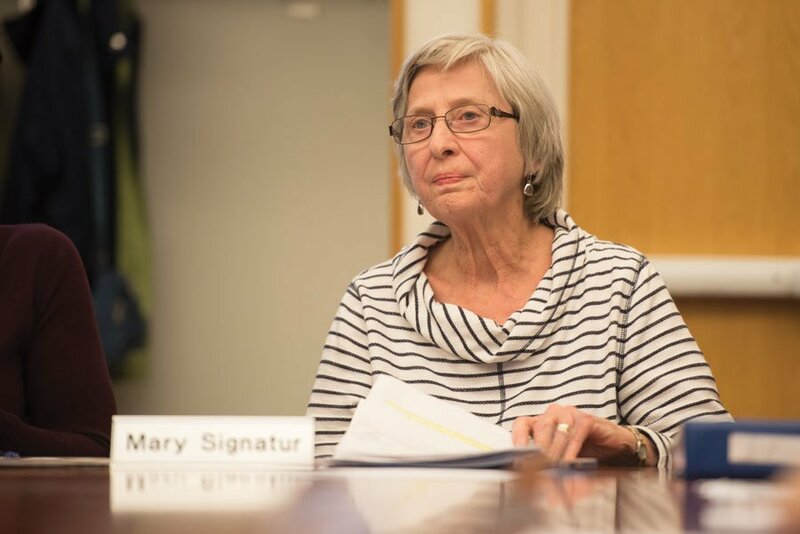 Mary Signatur, chair of the Commission on Aging. Commission members expressed concerns Thursday over affordable housing in Evanston. Members of Evanston’s Commission on Aging discussed concerns Thursday over the affordability of recent proposals for housing development in the city. The commission, which includes 15 members who advocate for elderly residents in Evanston, examined plans such as the proposed 831 Emerson development project — which is awaiting a vote by City Council — and a proposed 16-story apartment tower on Sherman Avenue. Commission members said the proposed developments may not contribute affordable housing to the city and could further price out elderly residents. “(The development) is a little worrisome to say the least,” said Mary Signatur, chair of the commission. Members also expressed concern over how some developers say they will contribute money to the city’s Affordable Housing Fund in lieu of creating affordable units. Commission members said the fund will need to be carefully managed as new aldermen join City Council on Monday. Audrey Thompson, the city’s long-term care ombudsman who works with residents of nursing homes, said she continues to work with officials on figuring out how the city’s $1.8 million Affordable Housing Fund can help residents, especially older residents, stay in their homes longer and receive financial support if needed. Alan Factor is a member of the commission and also volunteers with the Age Friendly Evanston! task force, which was created by Mayor Elizabeth Tisdahl in 2013. The task force works to make the city more accessible to residents of all ages. He said the task force is looking at ways to develop housing for older residents who are struggling to afford housing in Evanston. Factor said the task force is working with a coalition of local organizations, including Connections for the Homeless and the YWCA Evanston/North Shore, to address issues of housing affordability. “One thing that we would like to see developed is intergenerational housing,” Factor told The Daily. Signatur told The Daily that intergenerational housing helps keep older residents connected to other residents of all age groups. “Separating people from the rest of society doesn’t sound too good,” she said. Factor said he understands how the city needs development to have a steady stream of tax revenue. Still, commission members are most concerned about the development pushing out older residents, he said. Although the Commission on Aging serves mostly in an advisory role to city leaders and aldermen, its members have made sure their voices are heard by showing up to ward meetings and City Council meetings, commission member Jane Wickenkamp told The Daily.